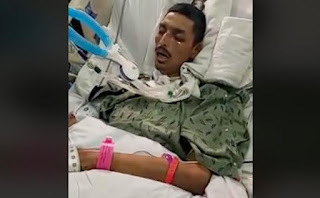 Nutrition and hydration have been restored to a 32-year-old man in a coma in an Arizona Catholic hospital after his mom posted heartbreaking videos on social media last week saying that doctors were slowly starving her son to death. David Ruiz, a father of three, suffered a stroke and subsequent brain injury that left him in a coma on December 31. Doctors declared David brain dead about two weeks ago, despite him twitching, raising his toes, and moving his fingers when his mother and other family members talked to him. His mother, Patricia “Tricia” Adames, 51, made an emotional appeal on Facebook last week to anyone who could help save her son.